AIB International was founded in 1919 as a technology and information center for bakers and food processors. 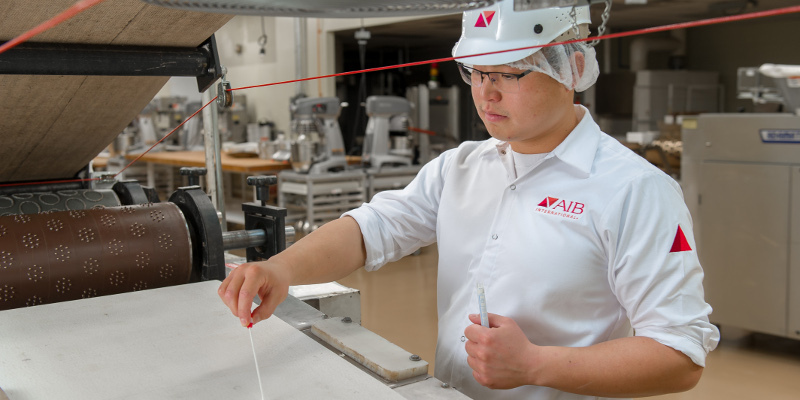 For 100 years, AIB International has worked hand-in-hand with the world’s top food and beverage companies to advance the safety and quality of food. At the 2019 Global Food Safety Conference (GFSI Conference), AIB International looked to the next hundred years with a new brand launch and provided a sneak peek at one of its yet-to be-released training solutions. “AIB International has been a trusted food safety ally for the past 100 years. Our new brand is a refresh, but also demonstrates that we are focused and committed more than ever to our clients’ quest to deliver safe, delicious products to every consumer every day,” said Andre Biane, president and CEO of AIB International. In line with helping companies deliver on their promises, AIB International also demonstrates an augmented reality training concept that is in the pilot stages of development. The customizable simulation takes real-world images and video and overlays the concepts and facts employees need to do their jobs. GFSI Conference 2019 takes place February 25 – 28, in Nice, France.